You would be hard pressed to find a stock in the S&P 500 that is having a stronger run than Apple is right now (NASDAQ:AAPL). Apple just reported earnings that were, quite frankly, unprecedented to even the most trained and educated eye. 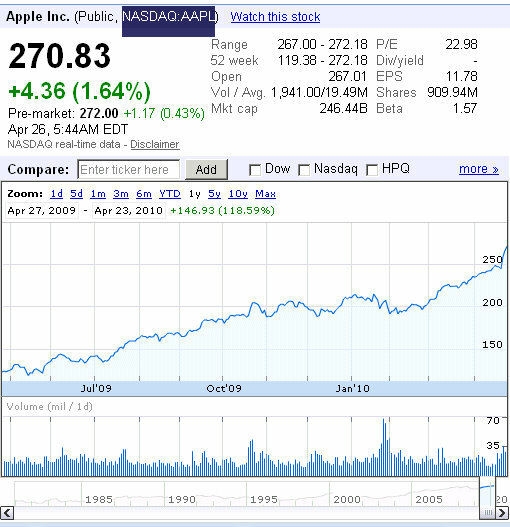 Profits for Apple rose at an astounding 90%, and nearly every stock analyst undercut the earnings forecast on Apple. Apple reported that its profits rose to $3.07 billion, or $3.33 a share, compared with $1.62 billion, or $1.79 a share for the same span last year. Revenue climbed a stunning 49% to $13.5 billion, and the company reported that it sold 8.75 million iPhones in the January-March period – about 1.75 million more than analysts expected. Mac computers and iPod music devices also surprised with big upside. Consensus estimates had called for $2.45 a share in earnings on $1.2 billion in revenue, so the income was 36% higher than all analysts were expecting. While that sounds like a lot, and it is, it’s about in the median of the past five quarterly upside surprises: +76%, +27%, +17%, +22% and +27%. 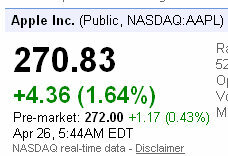 Apple’s income beat expectations by 36%! Again, I believe you would be hard pressed to find any stock currently being traded that has out-gunned the stock analysts by over 36%. These outstanding earning figures are what allowed Apple’s stock price to hit an all time new high on Wednesday, April 21st.